Seek not sameness, but uniqueness. Wheat Montana Bakery & Deli is the quintessential 21st century, family owned and run, stagecoach stop where travelers can take refuge and replenish. Wheat Montana Farms, where this all started, is 13,000 dry land acres nestled between the Continental Divide and the confluence of the Madison, Jefferson and the Gallatin Rivers forming the mighty Missouri River. The aroma of freshly baked bread should set the stage for what is in store for the thirsty or hungry among you. Our deli offers fountain drinks, Italian sodas, espresso's and Montana made lemonades. Hungry? Feast your eyes on the freshest bread in the world combined with daily sliced meats and cheeses and an array of fresh sandwich vegetables and gourmet soups plus our own Wheat Chili should satisfy any palate. Too early for a sandwich you say? Cinnamon rolls of every variety, croissants, turnovers, cookies, brownies, and our fresh Breakfast Bagel Sandwich...what more need be said except the only way to deal with temptation is to yield to it! All baked fresh every day. Scheduled tours of the bakery upon request. Wander through our gift store which includes clothing, made in Montana jellies, syrups, pastas and jams, plus wheat decorations to name just a few items. Read about our Guinness Book of World Records field to table triumph where we went from wheat growing in the field to a fresh baked loaf of bread in 8 minutes 24 seconds! The Wheat Montana Bakery, in the same building as our deli provides on average 10,000 loaves of bread a day to appreciative customers throughout the Rocky Mountain region. Enjoy our fine sandwiches, pastries and bread in a stimulating atmosphere. 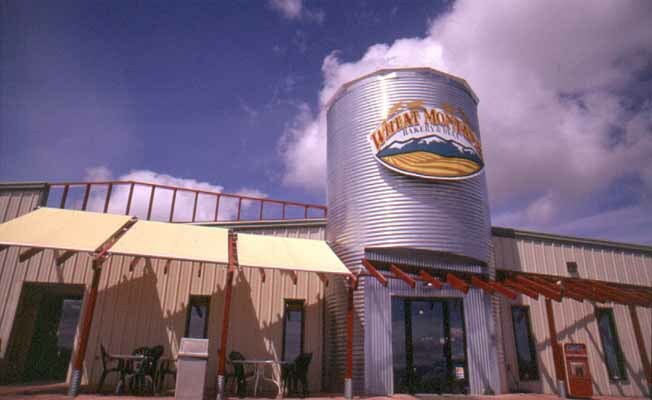 Let Montana feed your imagination and Wheat Montana feed your palate.